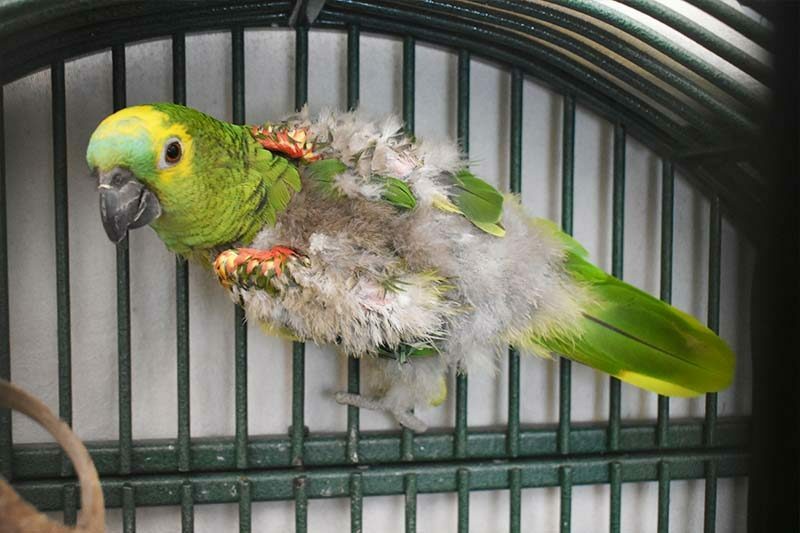 Do You Know This Bird Abandoned at the New Hampshire SPCA? 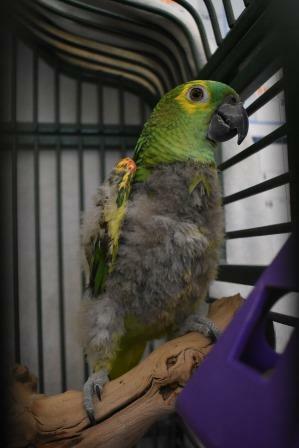 On Friday, May 11, 2018, the staff of New Hampshire SPCA were shocked to find an Amazon Parrot abandoned at our building in Stratham. The bird was inside a trash bag which was discarded among donations. The New Hampshire SPCA is hoping to make contact with the woman that abandoned the bird in an effort to learn more about its history. 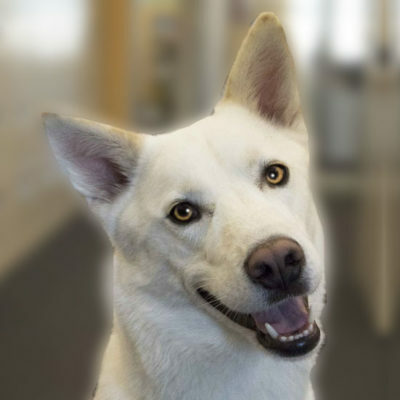 At approximately 10:30 am on Friday a staff member of the NHSPCA noticed a soft carrier inside a white plastic bag. She pulled it out assuming someone had simply donated it. The bag was pulled closed and suctioned tight against the sides of the carrier. She was stunned when she opened it to find what is believed to be a Blue Fronted Amazon. The bird was taken immediately to be evaluated by our in house veterinarian, Dr. Stephen Gentilella who determined that the bird was not in immediate distress. Since arriving on Friday, the bird, now known as “Mayday”, hasn’t shown any signs of eating. “He hasn’t eaten, which is a concern. Without information from his original owner, we are definitely at a disadvantage. He will be seen by a veterinarian for evaluation on Monday,” said Director of Operations, Desiree Roberts. Mayday appears to be a bird that self-plucks his feathers and has a sweet but nervous disposition. 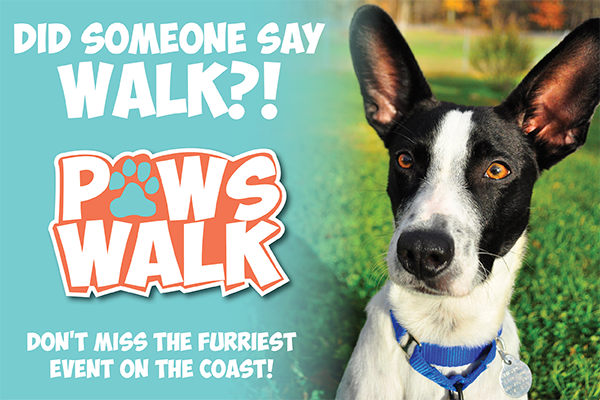 The public should be aware that abandoning animals is a misdemeanor in New Hampshire. 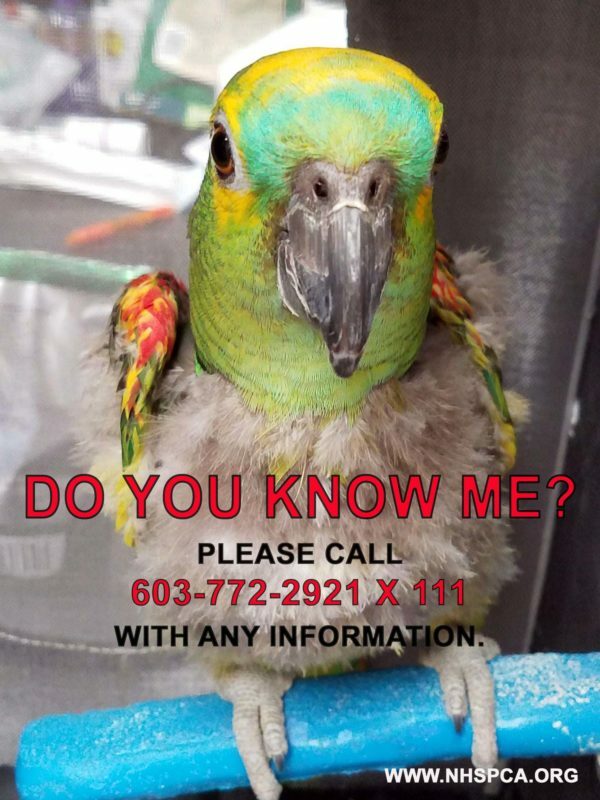 If you think you know this bird, the New Hampshire SPCA is very interested in any information you may have. Please contact the NHSPCA directly at 603-772-2921 x 111. If you would like to help with the cost of care for Mayday, and other victims of abuse or neglect, you can make a tax-deductible contribution to the SOS FUND by going to www.nhspca.org. Gifts to the SOS Fund can also be made by phone at 603-772-2921 x120 or by mail: New Hampshire SPCA, PO Box 196, Stratham, NH 03885. Help with the cost of care for Mayday, and other victims of abuse or neglect. Your tax-deductible contribution to the SOS FUND will help pay for expensive medicine, veterinary care, medical supplies and many other costs that accompany animal rescues.